Mirena is an intrauterine device (IUD) manufactured by Bayer Pharmaceuticals as form of long-term birth control. More than 2 million women in the United States use Mirena as their choice of birth control. Despite its popularity, the IUD has been the subject of numerous adverse reports filed with the FDA ever since Bayer received approval to market and distribute the device in 2000. Serious side effects associated with the IUD include device migration, perforation of the uterus, vaginal scarring, pelvic inflammatory disease (PID), and infertility. Product liability lawsuits filed against Bayer Pharmaceuticals by women who suffered severe and permanent injuries continue to accumulate in state and federal courts. Mirena is a polyethylene plastic t-shaped intrauterine device that releases a birth control hormone called levornorgestrel in the uterus to prevent pregnancy. When low doses of the progestin hormone are released, it thickens the mucus around the cervix, inhibiting the entrance of sperm, and creates other conditions that significantly reduce the chances of conception. The device is inserted into the patient’s uterus by a trained healthcare professional. The horizontal section of the device is an anchor that keeps it in place within the uterus. 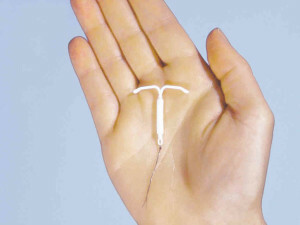 The vertical part of the IUD has polyethylene strings, which the healthcare provider can use to remove the device. Doctors advise women to self-check these strings once a month to make sure the device is still in place. According to Bayer, Mirena birth control is more than 99% effective at preventing pregnancy and is effective for up to five years. It is a reversible form of birth control and fertility is restored as soon as the device is discarded. In 2009, it become the first IUD to receive FDA approval as a treatment for heavy menstrual bleeding. If a woman wants to continue using the device after a period of five years, a healthcare professional must remove the IUD and replace it with another one. Bayer promoted its product as safe, hassle-free and convenient and marketed the IUD to busy moms. The contraceptive device was recommended for women who already have one child. Some of the injuries related to Mirena IUD side effects are life-threatening. When the device migrates, it also increases the chances of conception, and if pregnancy occurs while the IUD is inside the body, it can endanger the health of both mother and child. They device can put women at increased risk of: an ectopic pregnancy, septic abortion, miscarriage, premature labor, and premature delivery. Women who become pregnant or have major medical complications as a result of using Mirena may need to have the device surgically removed. Some women need to undergo multiple surgeries if the physician has difficulty locating the device or if there is extensive damage to the uterus and internal organs. After the surgeries are performed, there is still the chance that the patient will need additional care to treat permanent injuries. In 2009, the FDA sent a warning letter to Bayer Pharmaceuticals informing them that they exaggerate the effectiveness of the IUD while also downplaying the serious medical risks and side effects to consumers. The FDA accused Bayer of engaging in misleading and deceptive marketing practices by claiming that using a Mirena IUD can stimulate more romance and intimacy between couples in its ad campaign targeted to busy mothers. Mirena was approved as a contraceptive device, but suggestions that using the IUD will lead to more emotional satisfaction are unsubstantiated. Results of clinical trials actually dispute the claims made by Bayer Pharmaceuticals. According to medical studies, 5% of the women who used the device experienced a decreased libido. Other side effects reported in the clinical trials included depression, nausea, and nervousness. Bayer Pharmaceuticals was also accused of omitting information regarding health risks linked to Mirena. The FDA stated that the marketing materials failed to disclose that individuals who had been previously diagnosed with urinary tract infections, pelvic infections, and certain types of cancer shouldn’t use an IUD. Bayer was also admonished for failing to adequately warn consumers about side effects such as headaches, ovarian cysts, infections, irregular bleeding, and uterine perforation. Negligence, failure to warn, and deceptive marketing practices are among the causes of action leveled against Bayer by Mirena lawyers. The legal complaints allege that the company was aware of serious side effects, yet intentionally failed to inform consumers and the medical community about potential risks. The lawsuits also claim that Bayer was negligent and didn’t exercise reasonable standard of care while designing and producing the device. Women who filed claims against Bayer are seeking compensatory and punitive damages for their serious injuries. Those who have been harmed as a result of using Mirena birth control may be eligible for compensation. A products liability lawyer can explain your legal options and best course of action for pursuing damages in a court of law. Monetary damages recovered in a lawsuit may include compensation past and future medical expenses, lost wages, loss of expected future earnings, emotional distress and legal costs.